A total of 42 drivers in NASCAR’s Camping World Truck Series hope to be part of history Saturday afternoon when the 36-truck field for Sunday’s Good Sam Roadside Assistance 200 is set during qualifying at Rockingham Speedway. Friday’s two practice sessions were all about getting acclimated to the abrasive 1-mile oval where tire management is critical. And if history is any indicator, drivers will use nearly every inch of the high-banked racing surface during Sunday’s 200 lapper in hopes of finding grip. “I feel like at this track you don’t have a groove,” said Parker Kligerman, the winner at Rockingham of an ARCA event in 2009. “You go where your race truck works. “You’ll see everyone qualify at the bottom, and that works for about a lap. And then from there, you’re going anywhere you can go. If the top works, you go to the top. If the middle works, you go to the middle. Following a four-year hiatus from the sport, the Virginia native competed in the truck series season opener at Daytona in February. The former Daytona 500 champion is slated to share the driving duties of the No. 27 Chevrolet in the truck series this season with his son, Jeb Burton. “My dad has a big fan base and, hopefully, I’ll have a big fan base one day,” said Jeb Burton, who will be making his first start on a 1-mile oval this weekend. “A lot of people like the way my father talks. They make fun of him a little bit. With the Sprint Cup Series set to run at Texas Motor Speedway Saturday night, NASCAR’s truck series will be thrust into the spotlight Sunday afternoon. Third-generation driver Ty Dillon predicts a lot of eyes being on Sunday’s event in Rockingham. “I think (racing on Sunday) is huge,” said Dillon, whose grandfather is NASCAR team owner Richard Childress. “It does a lot for the truck series. You’ve got the big Cup race Saturday night and then no one has anything to do on Sunday. And everybody is usually waiting for the race on Sunday. If prerace ticket sales are any indication, a large contingent of fans will greet NASCAR’s return to Rockingham Speedway. As of mid-afternoon on Friday, just a handful of tickets remained for frontstretch grandstand seating for the 200. There are still some tickets available for the stands over looking Turns 1 and 2.But a favorable weather forecast could likely result in many of those seats being scooped up on race day. NASCAR legend Donnie Allison is scheduled to display the green flag to the field shortly after 1 p.m. on Sunday. 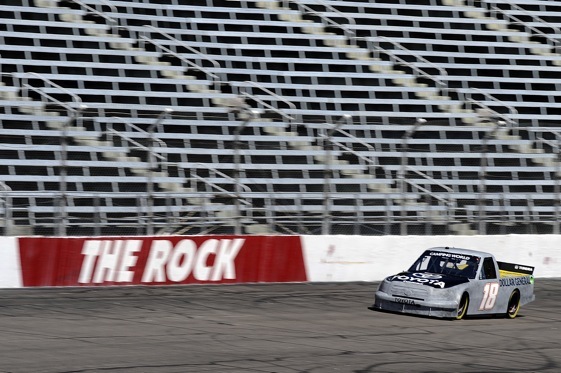 Much remains the same about Rockingham Speedway since it temporarily closed in 2004. Notable changes are the addition of SAFER barriers and a new measurement of the racing surface. In the past, the track was measured at 1.017-miles. 500-mile events here covered 492 laps. But track officials now show the official distance around the oval to be exactly a mile in length.